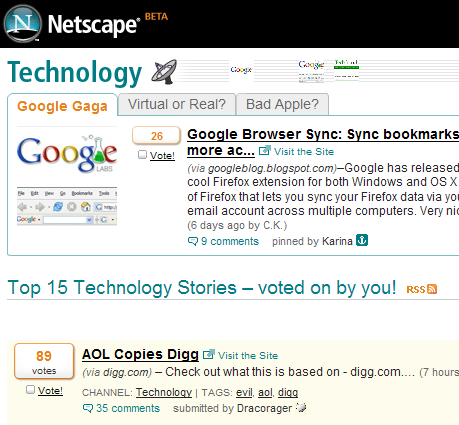 Netscape Clones Digg: Where is the innovation ? Is this Jason Calacanis the same guy who created Weblogs Inc, the most successful blogging network ? I find it impossible to believe when I look at this new Netscape portal which is nothing more than an ugly cousin of Digg.com with the sole purpose of generating ad dollars. AOL have virtually copied all the features from Digg like people leave a story, user vote for it and depending on the vote numbers, the story appears on the homepage or is buried down. Users can leave comments on stories and even rate comments. Like Digg v3, AOL's version will also have different categories like Technology, Music, Politics, etc. That's where the similarity ends. The service is slow but probably that's because it's still in beta. The UI isn't impressive with ads hanging in the middle. Why would anyone leave Digg for Netscape ? Since Jason is the main guy behind Beta Netscape Portal, I think it will have the "Digg Effect" - get lot of traffic for a few days but then meet the fate of Netscape Navigator. Kevin Rose must a happy and relieved man. Other two interesting things. One, the top story in Technology section is AOL Copies Digg. Second, there will be a category called "Do no evil," which will deal with stories about heroes and villains. Does the mind stop innovating when you are with a big corporate house ? Why did Scoble leave Microsoft ?